A site called “The Connectivist” tries to argue that U.S. broadband isn’t really as bad as it might look, but the site’s motives are questionable, since it’s a “partner” of the National Cable & Telecommunications Association. Once again, the latest survey of the current state of broadband around the globe [PDF] shows that, while improving, the U.S. still lags behind other developed countries, like South Korea, Japan, Switzerland, Latvia, and Romania in average broadband speeds and access to decent Internet. But leave it to the cable industry to try to convince America that everything is A-OK, and to try to do so without mentioning that this message is being brought to you by the cable industry. 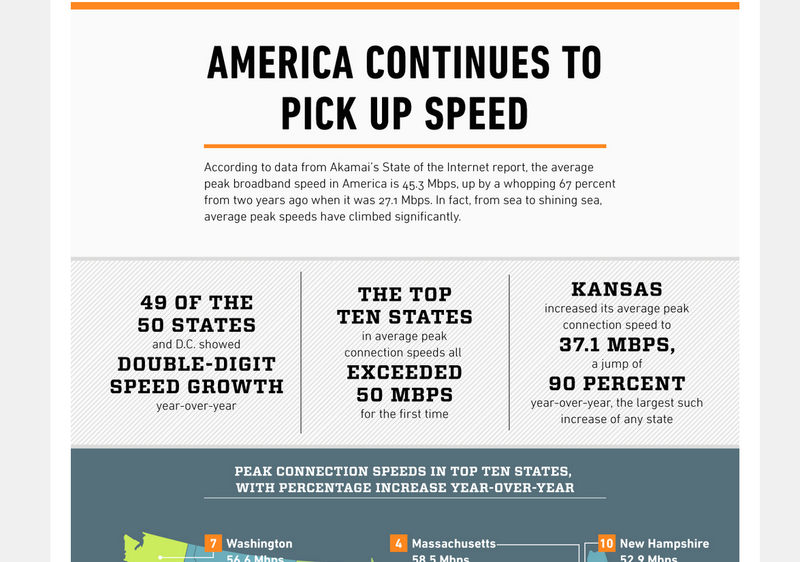 This morning, I received a PR pitch for a site I’d never heard of, dubbed “The Connectivist.” More precisely, the pitch was to get me interested in the Connectivist’s infographic on just how darn good American broadband is, or rather, how much it’s improving. Thus, the Connectivist tries to paint a rosy portrait of U.S. broadband by comparing America’s fastest states with the national rankings, presumably based on the misguided math that (1 U.S. State) = (1 Country Elsewhere in the World). By that logic, the mysterious Connectivist — you’ll notice that no one actually takes a byline on this particular story — argues that if you broke out the highest-performing states and put them in the international list, they would occupy four of the top 10 spots, and 10 of the top 20. But when you compare the 10 countries and 10 states (or rather, 9 states plus D.C.) to each other, it’s not an apples to apples comparison. The populations of those nations range from around 2 million for Latvia all the way to more than 126 million for Japan. Taking out the two extremes, that still comes out to an average population of around 17.4 million. But the U.S. locations injected into this list only have an average of around 4.3 million people, only a quarter of the number of people in the average for the 10 non-U.S. countries. So this idea that you can simply compare America’s fastest states with the world’s fastest countries is utter nonsense. The only way to do a true apples to apples comparison would be to look at the data for areas with similar conditions, including population size and area, which the Connectivist doesn’t do. The site simply glosses over the fact that while broadband in the U.S. is improving, it’s still not a world leader in deploying high-speed Internet access to its citizens. Even though nearly three-quarters of the U.S. has access to what the FCC currently defines as “broadband,” meaning at least 4Mbps downstream, that’s still not a high enough percentage to get it into the top 10 globally. In fact, that percentage barely puts the U.S. in the 40 of all nations. Likewise, only 39% of Americans have access to 10 Mbps service, which is what many people now consider the minimum acceptable standard for broadband. That ranks higher, putting the U.S. within the top 15 worldwide, but still pales in comparison to world leaders like Sweden (56%), the Netherlands (52%), and Romania (50%). Why is all of this not-as-impressive information omitted from the infographic that the Connectivist was so eager to share? For those unfamiliar with the NCTA, it’s an industry group, currently headed by former FCC Chair Michael “Yes, my dad was Colin” Powell, that hates you but wants you to keep paying your cable and phone bills. It’s also an organization that loves to inform the public through campaigns that it tries its best to keep its name out of. For instance, it’s behind other groups like Broadband for America, which pretends to be a coalition of companies — including, inexplicably, an Ohio tile company, some defunct Belgian business, and a bed and breakfast — that care about broadband access but which is just a front for the NCTA, which provides most of the group’s funding, to push its anti-net neutrality agenda. More recently, the NCTA was identified as the cash-addled brains behind a hipster-themed guerrilla marketing campaign for something called Onward Internet, to try get the youngsters in their corner in the NCTA’s fight to screw consumers.